During WWI and WWII women were trained as projectionists to take the place of male projectionists called up to fight. In general the women chosen would be usherettes, sales girls or other front-of-house staff who already worked in the cinema. During the early years of World War I, this was generally seen as something of a last resort and received a mixed reception from cinema workers at all levels. Derogatory cartoons of the time, such at the one appearing to the left, depict women projectionists as lazy and inattentive, more interested in reading and smoking that turning the handle on the projector. 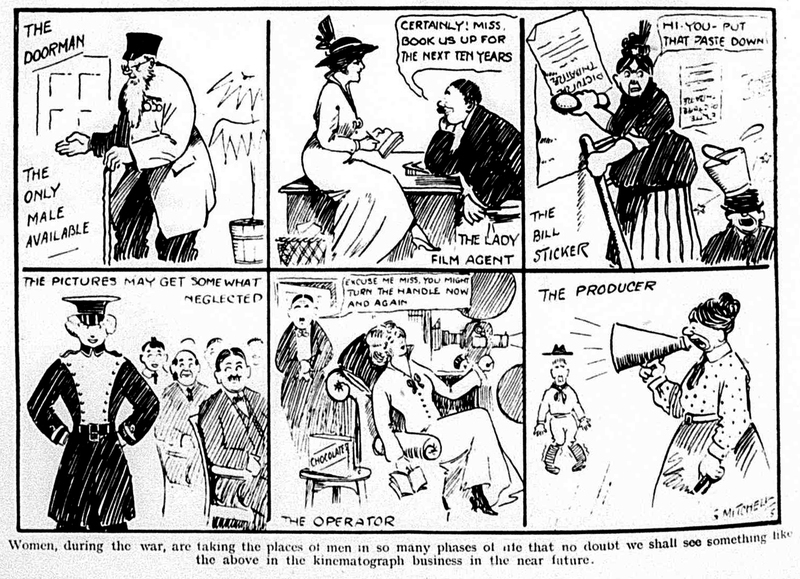 As the war dragged, women were generally accepted as projectionists and reports in the trade press - for example the Kinematograph and Lantern Weekly – include male chief projectionsits praising their women counterparts. In an article entiteld ‘A Word for the Lady Operator’ one man highlighted the capabilities of his female colleague stating that she was, ‘I would say, the most competent projectionist at the present time in Rotherham’. In another article from 1917 a man responsible for training women operators noted that ‘he is pleased to say he is getting excellent results’ and that ‘if these girls are trained and supervised primarily by experts … they are as receptive as men, and in the majority of cases considerably more conscientious’. However, it was an accepted condition of wartime employment that the women’s elevation in status was temporary and most women projectionists returned to front-of-house duties once the war was over.